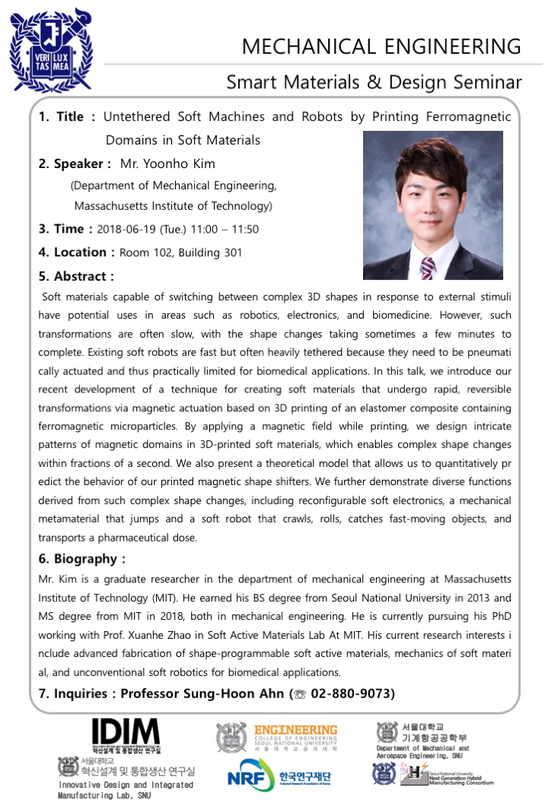 I am a graduate student at Massachusetts Institute of Technology and currently ​working as a research assistant with Prof. Xuanhe Zhao in ​﻿MIT Soft Active Materials Laboratory﻿​. I believe that problems encountered in daily lives can be the biggest source of creativity and that improvements can be made only by those who discover those problems. Also, I believe strong engineering background can be a powerful tool to find breakthroughs when solving those problems. My desire to become a professional researcher emerged from my research experiences in college, through which I tried to unravel human healthcare problems by applying principles of mechanical engineering. From these experiences, I realized that my chosen field of study could be used to improve people’s lives in practical and tangible ways. My current research interests include advanced fabrication and design of soft active materials, mechanics of soft materials, and unconventional soft robotics for biomedical applications. Through my research, I wish to address unmet needs and challenges in healthcare through applying principles in mechanics and design to biomedical problems. © 2018 Yoonho Kim. All rights reserved.